Not everyone has the pleasure of a sprawling backyard or empty garage to turn into a home brewery. Many homebrewers find themselves in smaller homes—especially in the urban areas of the world where apartment and condominium living reign supreme. But just because space is limited doesn’t mean that you can’t make beer at home. 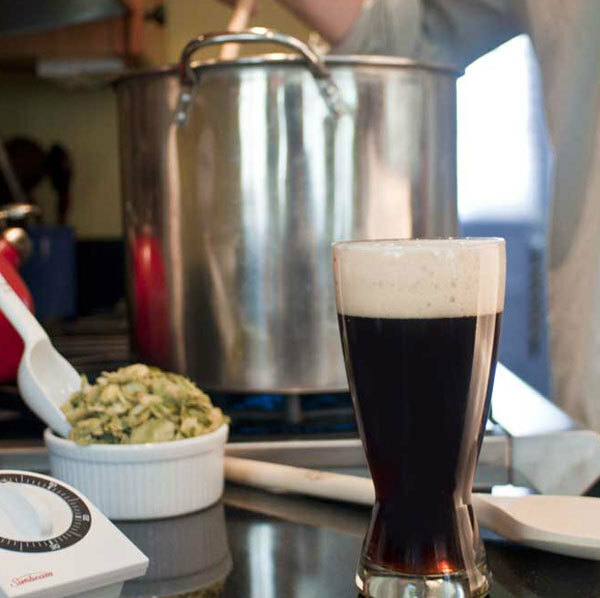 Let’s take a look at how to navigate the homebrewing process, from grains to glass, in a small apartment setting. It has become the norm for homebrewers to brew 5-gallon batches. Beer recipes and homebrew equipment kits are typically tailored to the 5-gallon homebrewer, and I challenge you to inquire at your next homebrew club meeting as to how many folks stick with 5-gallon batches. Some of the more serious (and thirsty) homebrewers will move on to larger batches, but up until recently batches under 5-gallons were uncommon and typically reserved for experimentation purposes. 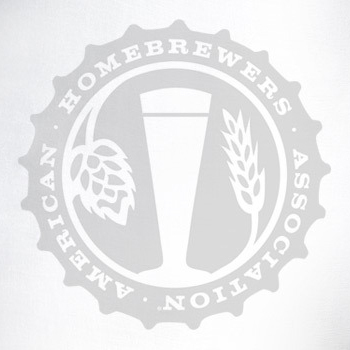 But as the interest in homebrewing is growing, more and more homebrewers are moving to small batch brewing. In our case, it is great for the small-footprint brewer who has limited space to make beer. Committing to one to three-gallon batches drastically reduces the size of equipment required for brew day, fermentation and also means less beer to store after completion. The size of your home brewery aside, small batch brewing has numerous other advantages. For the mad scientist, it allows you to get crazy with your recipe formulation with minimal risk should something end up undrinkable. Smaller batches also mean less to store and drink if you have trouble getting rid of 5-gallons of ready-to-drink beer. And it’s a cheap way to try out homebrewing if you are wanting to test out the waters before committing to more equipment and larger batches. The rest of this article will assume brewing 1-gallon all-grain batches. 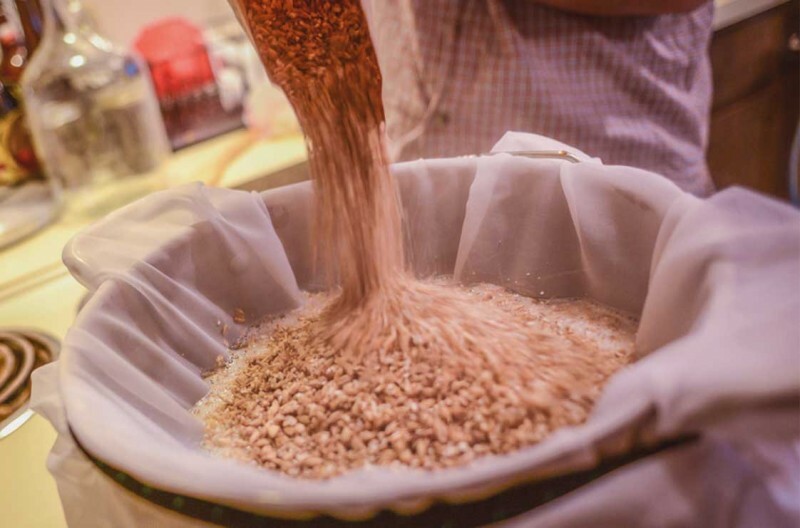 The 1-gallon all-grain brewer can ditch the mash tun and sparge pot, and adopt the no-sparge brew in a bag (BIAB) all-grain method where the entire mashing and boiling process is conducted in the boil pot. Check out our step-by-step tutorial on how to conduct a BIAB brew day. With this method, a sizable boil pot is still necessary to be able to hold the the full volume of a no-sparge mash, including grains. Unless you are brewing very high gravity recipes, a 5-gallon pot is probably as big as you’ll need. If you run out of space, malt extract can be used in place of base malt to help reach the target gravity without needing extra space to accommodate large grain bills. With a small volume of liquid in the mash and boil, using your kitchen stove top as the heating source is a viable option. This eliminates the need for the turkey fryers and propane tanks. Some small batch brewers have even taken up to mashing in ceramic vessels and placing them in a stove preheated to the appropriate temperature to maintain mash rest, but approach this method with caution. As for utensils, you can forgo the fancy wooden mash paddles and long stainless steel spoons and use whatever spoon-like kitchen utensils you have around the kitchen that can reach the bottom of the pot. Just be sure to take into account the material being able to withstand heat. Chilling is also a little more manageable on a smaller scale. With the small volume of liquid you can skip the immersion and counter-flow chillers, and use an ice bath with great success. 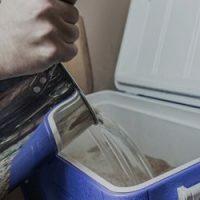 Once the wort stops steaming from being cooled in the ice, cover the pot with a sanitized lid and stick it in your freezer to get down to pitching temperatures. Just don’t forget about it! While your beer chills, take time to prepare your fermenter and post-boil equipment. First, fill up a container with no-rinse sanitizer and start soaking anything that touches the beer after the boil is complete. Consider picking up a rectangular, plastic planter that can hold the sanitation solution and be able to submerge longer tools like a mini-auto siphon, tubing and spoons. This allows for managable sanitation in a small space, without creating a huge mess. Pour some of the solution into your primary fermenter to make sure it’s free of contaminants. Once the beer is ready, take your sanitized mini-auto siphon and start moving the beer from the pot to the 1 gallon glass jug as you would any batch of beer. If you are brewing a style that needs more head room, like certain wheat styles, pick up a 2-gallon plastic bucket for primary fermentation and use the glass jug as secondary if needed. Then pitch the yeast, plug the fermenter with an airlock, and call it a brew day! With 1-gallon fermenters, you have a lot of options for flexible storage. Jugs can fit nicely on tables and counter tops, though be sure to take precaution that the wort is shielded from light to prevent skunking. It’s nothing a dark t-shirt or dish towel can’t take care of. If you have a closet, you can fit a few 1-gallon fermenters on a single shelf, just be sure to do a load test the ensure the shelves are up for the task. When selecting a space, ambient temperature is key. Find a location that stays in the range of your yeast’s preferred temperature, and avoid areas with lots of fluctuation. If you want to get serious about managing fermentation, pick up a mini fridge that can fit in your closet. 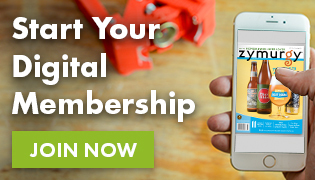 Depending on the size, you can ferment one, possibly two 1-gallon batches at a time. Another option for affordable temperature control without having to buy and find space for a refrigerator is the aquarium heater method. It’s cheap, easy and it takes up minimal space while still having complete control over fermentation temperatures. Last but not least, you need to package your beer. Bottling is usually the go-to method for small batch and apartment brewers since it requires the least amount of equipment and space. And, is pretty easy to do when you’re only bottling six to 10 12-oz bottles at a time. If you use 22-oz bombers, that’s even less space and work! There are two main options for small batch bottling. First involves adding carefully measured amounts of priming sugar (or use a product like Carbonation Drops) to each bottle and then using a bottle wand attached to the mini-auto siphon to fill up each bottle. The second option is a mini-version of how most bigger batch brewers bottle. 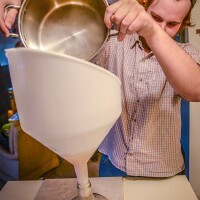 Add the desired amount of priming sugar to a 2-gallon plastic bucket, rack the fermented wort atop it, and then attach the bottle wand to the end of the siphon and fill bottles as usual. Check out our Let’s Brew section for a more detailed look at the typical bottling procedure. Having under a case of beer bottles leaves a lot of options for storage, all similar to the fermenter ideas above. The main thing is to pick a location that is warm enough for the yeast to do their final job of conditioning and carbonating the beer. Kegging is also an option, though not as practical when you’re only turning out 1-gallon of beer due to the expense and amount of equipment it requires. An alternative that is somewhat in between bottling and kegging is to use a mini-keg (or a product like the Beer Box) where the full batch of beer is conditioned in a plastic cask-like vessel and poured into a glass directly. That’s it! You now know how to conduct a brew day in a small apartment without breaking the bank or getting voted out by your roommates. The big key is planning and organization, which oddly enough (or maybe not) is the key to brewing any batch of beer.